The Mantua Environmental Commission is aiming to ramp up activity in the Chestnut Branch Park butterfly garden this year after a long winter. The group is looking to add an upcycled fence in the center and plans to remove weeds that have overtaken much of the garden. Gardens demand long labor hours after winter passes and before summer’s glow. And when a garden gets hit with multiple nor’easters, those hours multiply. About 12 years ago, a Mantua Township resident dug up the soil at Chestnut Branch Park and started a butterfly garden. In 2010, the Mantua Township Environmental Commission took on the responsibility of the garden and has been managing it since, with the help of community volunteers. However, the garden is in need of more upkeep this year as the nasty winter until recently has stifled any progress leading into spring. The purpose of this type of garden is to create a feeding source for butterflies and caterpillars — and create another aesthetically pleasing aspect to a park. Butterflies are pollinators; however, much of their natural habitat has been destroyed due to human activities such as building homes, roads and other projects. The United States Fish and Wildlife Service lists more than 20 types of butterflies and moths as endangered, mainly because of loss of habitat. Of the maintenance of the garden last year, Heather MacGregor, commission secretary, said, “It got the best of us.” Due to other projects, the garden took a backseat and weeds, mugwort especially, took claim of the garden. While planning upkeep of the park garden, the commission is hopeful community members will consider managing their own gardens to increase the chance of a butterfly population boom. “We are trying to get the word out to plant for the butterflies, birds and other insects,” MacGregor said. With more people managing individual gardens, these insects will have more food options, thus increasing the population and further pollinating the area. “All the butterflies are having trouble,” MacGregor said. Butterflies eat nectar on flowers and caterpillars eat plants, so an array of planting is ahead of the team. Some native plants in the garden previously were elderberry, spicebush, fothergilla, arrowwood viburnum, American holly, winterberry holly, blue flag iris and witch head. Many of these are native to the area. During the April Mantua Township Environmental Commission meeting, the crew talked about plans for upkeep and even the addition of a pallet fence to guard from sight the garden tools. The fence, in the beginning, will serve to emphasize the beauty of the garden, but the commission is looking into incorporating the pallets into viable planting space. “It’s a way to grow up,” MacGregor said. WIth these upcycled pallets from a local business, the commission has the ability to create such things as a living wall where pots of soil and seed are placed within the pallet and the plants then take their natural course to decorate. Many gardeners use pallets to reduce space used and each one can serve as, for example, a separate herb garden. While adding an inventive look to the garden, the possibility of utilizing pallets as green space just adds to the reason for the garden — to populate the area with pollinating insects. 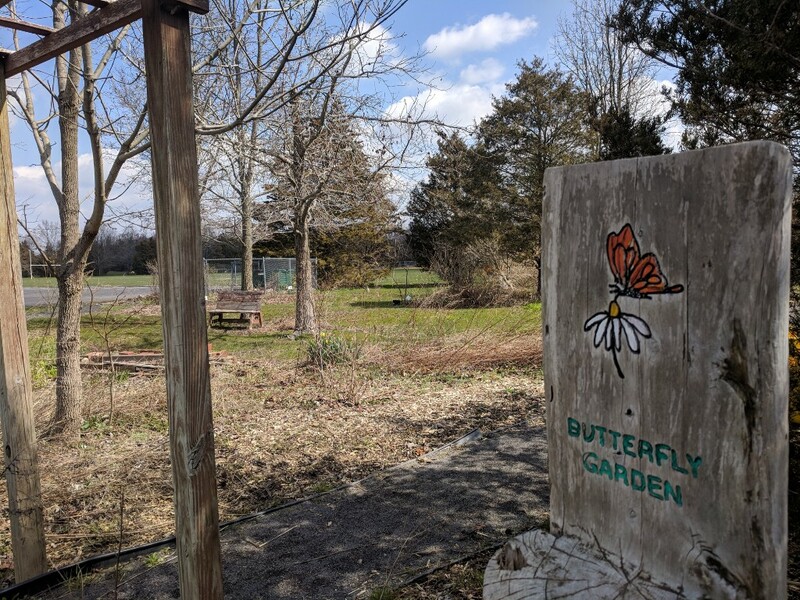 Aside from plans for the Chestnut Branch butterfly garden, the environmental commission is hoping the garden will continue to inspire community members to plant their own gardens to increase the butterfly population in the season and, in turn, assist with the health of the ecosystem.